Chihuahuas may be tiny pups, but most of them have a big appetite for play. But given that many dog toys are just too big for them how do you go about choosing the best toys for Chihuahuas when there are so many in the shelves? Here is a look at seven of the best selling and best reviewed options that are well worth any Chihuahua pet parents consideration. Always supervise your Chihuahua when he gets a new toy. Most pups like to have a furry friend on hand to toss, chew, bite and, when playtime is done, snuggle with. For a small dog like a Chihuahua however some stuffed toys are simply a little to heavy and cumbersome for them to become engaging enough to serve as a full time pal. This rough-play toy is crafted from a durable fur covered nylon and features a squeaker in the tail. Some pet parents did report that the squeaker was not quite as durable as the rest of the racoon, but even when/if that was broken it still provided many more hours of enjoyment. A bonus pointed out by others was the length of the toy, as its long silhouette makes it great for a game of tug as well. A light, bouncy ball can provide hours of fun for an active Chihuahua but many smaller sized balls are just not durable enough to stand up very long to aggressive bites and chewing. The West Paw Zogoflex Jive was created to help solve that problem while also still providing lots of fun for dogs who love to chase and fetch a ball. The ball is crafted from a lightweight, but durable material called 'Zogolex' that is designed to stretch without stretching out and be softer to a small pup's mouth than many standard dog balls are. It is available in a number of different sizes, with the small - which is about the size of a tennis ball - and the mini - a golf ball sized option - being the most popular among Chihuahua pet parents according to online reviews. The shaping of the ball features a groove that runs the circumference of the toy. This alters the motion according to the way it is thrown or tossed which can add a fun, unexpected element to a standard game of fetch. It also makes it easier for a smaller pup to carry and for their pet parent to hold. The durability of the ball is almost universally praised in pet parent reviews and so is the performance, with many noting how well the ball bounced and how much fun their very active Chihuahua fur kids have with it. The Planet Dog Orbee-Tuff 3" Snowball really does look like a snowball and is, in fact, billed as the 'world's first non-melting snowball for dogs'. It's a dog toy designed to make the game of fetch more fun for dogs of all sizes, but the smallest version - which is, say many reviewers perfectly sized for their Chihuahua - is lightweight and bouncy but the grooves in the ball also make it easy for their smaller pups to carry. The snowball is also water resistant and will float, making it a great choice for pool or beach play too. There is an added bonus to the Planet Dog Orbee-Tuff Snowball that many pet parents also appreciated: it is crafted from a crystalline textured, mint infused soft plastic that helps clean their pup's teeth as they play. Given that cleaning an active Chihuahua teeth is never an easy task this feature is something that is mentioned over and over again as a big plus in online reviews. In terms of durability the 'snowball' is highly rated as well. Some pet parents report that it has outlasted all of their pup's other fetch toys by far and the fact that treats can be added offers another element of interaction that can make playtime rewarding for your pup as well as lots of fun. 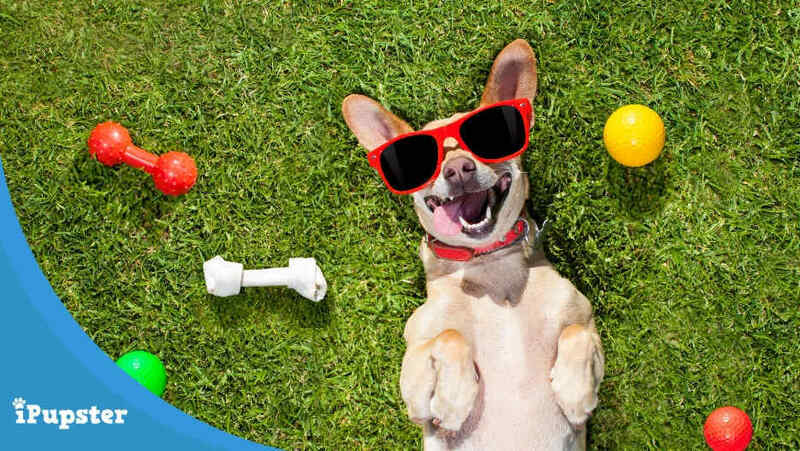 Most dogs love a good chew on a bone, but giving real bones to a small dog like a Chihuahua can be fraught with problems, as their sharp teeth can tear at them with relative ease but bone shards that result for that can be a serious choking hazard. Although this treat bone is designed for puppies, it can also be a great choice for a smaller Chihuahua. It's bone shape makes it easy to chew on and the soft rubber is gentle on smaller pup mouths. Once filled with treats it presents a nice intellectual challenge for your fur kid and the bright color makes it easy to find if it is tossed a little too far. Pet parents who praise this versatile dog bone toy do so for a number of reasons. Many like the fact that although it is a lightweight bone - and certainly lighter than many other KONG dog toys - it is also very durable and that it offers both a challenge and fun, as when chewed and bitten in certain ways it will squeak a little too! Tire toys are dog toy options that any pups love. They are great to toss and throw, great to chew on and, for many dogs, just great to carry around. The problem for most Chihuahuas though is that many of the standard tire toy options are just a little too big for them to handle. 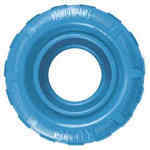 The KONG Puppy Tires toy is, as the name suggests, sized for puppies, so it will work well for many Chihuahuas as well. It is a treat fillable, soft but durable tire that has enough bounce to make it a great option for a game of toss and fetch but not so lightweight that it will fly too far and get lost. The biggest plus reported by pet parents in online reviews of choosing this toy is that it is very durable despite feeling rather lightweight. Many state that it can hold up to months of rougher play and aggressive chewing without shredding or becoming to 'chewed up' for their pup to play with safely. Other reviewers also comment on how enjoyably challenging the treat dispensing mechanism is. While some puzzle toys dispense treats rather quickly the overall consensus for this toy is that it offers a challenge that can keep pups occupied for quite some time, a plus for a breed that thrives on mental stimulation like the Chihuahua. The first thing anyone - anyone human that is - notices about the Rogz Grinz Treat Ball Dog Toy is just how much fun it looks. It's a brightly colored ball - available in several neon colors - and features a big set of cartoon dog teeth emblazoned on the front. This is more than just a cute ball toy though. The ball is crafted from a lightweight, waterproof material that makes it easy for a smaller pup to catch, toss and carry and which also makes it an excellent choice for anywhere outdoor play. When filled with a pup's favorite treats a puzzle element is added to an active play session, and, according to a number of positive online reviews that engaging playtime can last for several hours. 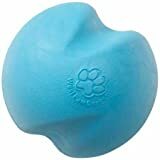 As a purchaser of this hilarious dog ball I too was also pleasantly surprised by just how durable the ball is, reporting that the material it is crafted from has a 'spring' that means that the shape holds even after an aggressive chewing session. And almost every reviewer remarks on how amusing it is - for them - when their pup has the cartoon teeth positioned 'just right' when holding the ball! 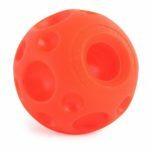 The Omega Paw Tricky Treat Ball is another great, nicely sized fetch toy for smaller dogs. It is lightweight, available in a number of bright colors and features an indented surface that makes it easy for smaller mouths to navigate and grip. This is a big plus for Chihuahuas who can become very frustrated when a ball is just too big for them to grip. The ball is called the Tricky Treat for obvious reasons; it is treat fillable and presents a nice, engaging puzzle challenge to add to a standard playtime. It is also, according to online reviewers, a durable ball that can stand up to some serious chew time even though it is relatively soft to the touch - and to a pup's teeth. Reviewers also comment that the puzzle aspect of the ball is every puzzling, and it does take a while for pups to figure out all the 'right angles' in order for them to be rewarded. However, may of them saw this as a plus as it extended solo playtime and their pups really seemed to enjoy figuring it out. The toys on our list are just a small selection of the many toys that are available for pet parents to choose from. When buying any toy for a small dog like a Chihuahua it is important to get the sizing right - if a toy is too big they simply won't play with it or get frustrated that they just can't play with it in the way that they would like too. Durability is very important as well. Many Chihuahuas are aggressive chewers and a toy that can be 'dispatched' too easily is not only a waste of money but could pose a choking hazard as well. Finally, for a bright, smart breed like the Chihuahua, toys that offer a challenge are a great pick as well. Puzzle toys that dispense treats serve two purposes though. The first is that they can keep these smart pups engaged and occupied for hours and the second is that they can be used at mealtimes to help fast eating pups slow down a little to prevent gastric distress.